Struggling to choose a counter depth refrigerator? Discover top brands & values in our buying guide. French door refrigeration is the most popular style of counter depth refrigerators. You have more refrigeration space than a side-by-side refrigerator and the doors do not swing out as much. What's the largest counter depth refrigerator? How deep are counter depth refrigerators? Are counter depth refrigerators deeper? You can buy a French door refrigerator with lots of different options. However, there doesn't seem to be any reliability measurements. We'll look at the most reliable brands, but first, let’s discuss the methodology. Over the last few years, we have published articles about the most reliable brands. However, certain products like refrigerators will fail more as a group than just a dishwasher or a hood. Refrigerators are on 24/7 while dishwashers are used more sporadically. We now have 30 service technicians averaging 8-10 calls a day, Monday through Friday, plus another 110 on Saturday. We simply compile the service calls and divide by sales for a service rate for the first year. In 2018 we logged 34,687 service calls and in 2017 30,761 service calls were logged. Customer education calls over the phone and damages do not count. We also don't distinguish between major and minor problems. If you call us for service, it is accounted for. This information is pretty interesting for many reasons. The average service rate is 28.94% in the first year for French door refrigerators versus 13.6% for appliances in general. From almost every manufacturer, the numbers aren't good, to say the least. However, the problems are more icemaker related than compressor failures. Here are the numbers. LG and Samsung are the most reliable by far despite selling more feature-oriented products. However, both brands have spotty service at best for when you do have issues. Fisher Paykel was a surprise as well at number 3 with under 16% service in the first year. They were purchased by Haier and overall their reliability has improved. The trend was better in 2018 slightly because we eliminated some less reliable brands. Although refrigerators fail more than any other appliance, refrigerators are also way more energy efficient than in previous years due to Federal regulations. Refrigerators, in general, have changed to be compliant with the new energy standards. You should save $100-150 per year in energy costs. One of the issues is with the ice dispensers. With an ice dispenser, you are sending an ice cube through a warmer refrigerator. This can cause leaks. Although this problem is annoying, it does not affect the cooling of the refrigerator. Invariably, the refrigerator will work. Should you buy a warranty for your refrigerator? Until 15 years ago, we did not sell warranties. You should consider one on a French door refrigerator just looking at the first-year service rates above. There are articles on this blog and comments written about nightmare service experiences. Just do not buy a warranty from a store without an actual service department. Third party warranties are a joke (only you will not be laughing). They will sell you the warranty without actually employing any service techs. You wouldn't notice the other part of what we consider as reliable. Bosch and Whirlpool are better at turning around parts than the others. With refrigeration, a one-day turnaround is our standard as you cannot be without one for very long. With a fail rate of 26% just on refrigerators, you will need some service with a whole kitchen of appliances. In addition to researching prices and features, you should know your service agent before you make any purchase. What is the difference between counter depth and standard depth? Roughly 6-8 inches, but the counter depth does not protrude from the cabinet. Twenty-four cubic feet is the largest counter depth refrigerator. You can learn about the largest counter depth refrigerators by clicking this link. The difference is height, because depth and width are standard. Are counter depth refrigerators wider? No, counter depths are made to fit standard 24, 30, 36, 42 and 48-inch widths. Are counter depth refrigerators more expensive? In most cases, a counter depth should be 10-20% more expensive than a regular depth refrigerator. Want some more information about counter depth refrigerators? 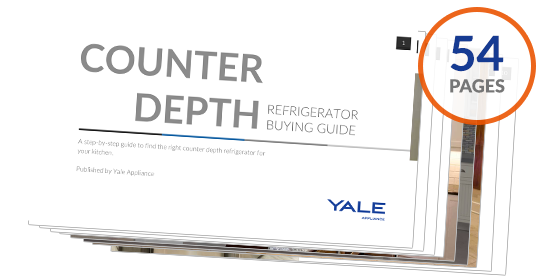 Get the Yale Appliance Counter Depth Buying Guide with features, specs, and detailed profiles of the major brands. Well over 400,000 people have read a Yale Guide.